Missing the Gallagher’s as much as we are? These seven epic quotes from Shameless season 1 should help fill the hole in your heart! So, as far as I can tell, we still don’t have a hard release date for Shameless Season 8. We have rumors, but those change so often that they really aren’t even worth repeating! After binging on the first seven seasons, I am definitely still feeling the Gallagher withdrawals! 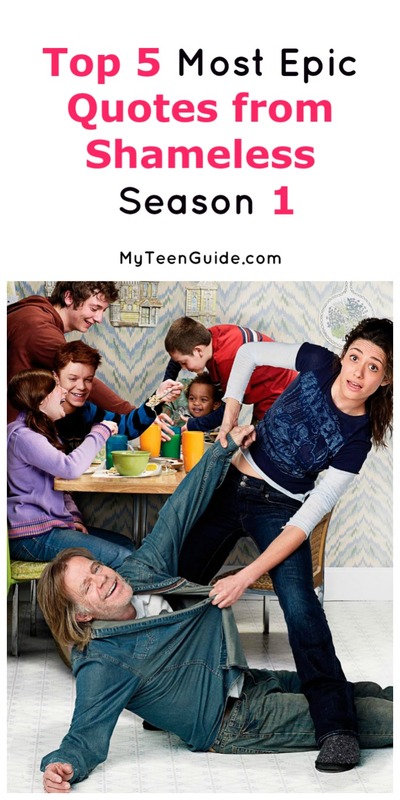 If you haven’t heard of it, Shameless is a comedy-drama television series that airs on Showtime. The series premiered on January 9, 2011, with its season 7 making its premiere on October 2, 2016 (so it’s reasonable to hope that season 8 will debut around the same time this year). The series showcases the lives of the incredibly dysfunctional Gallagher family, which includes dad Frank and six children: Sammi, Fiona, Lip, Debbie, Carl and Liam. The six children pretty much raise themselves since Frank spends his days drinking. Here are some awesome quotes from the first season of Shameless. Steve (aka Jimmy) is Fiona’s on again/off again boyfriend. Kevin Ball and his wife, Veronica Fisher are the Gallagher’s neighbors/friends. Kevin is also the owner of The Alibi Room (or was…see our post on what happened in season 7 if you don’t mind spoilers). Kermit is one of Frank’s buddies at The Alibi Room. Sort of. As Fiona said, Frank doesn’t really have “friends,” just people who haven’t gotten completely sick of him yet. Frank collects worker’s compensation after faking a job injury. It’s pretty much Frank’s main source of income! He takes a job, gets hurt, gets worker’s comp. Honestly, there are TONS of epic quotes from Shameless season 1! Most of them. however, have a lot of language that just isn’t all that appropriate for us to post. If you’ve watched the show, you know what I mean. If you haven’t, be warned: it’s not politically correct and it’s full of language that the FTC bans from traditional networks! Hey, as long as that doesn’t bother you, it’s probably one of the best shows on television. Funny yet full of heart. What are your favorite quotes from Shameless season 1? Share below!